Also: Game of the Year Awards, Baldur's Gate's birthday, Resident Evil 2, Hitman 2 and more! The year is almost over so it must be time for our Game of the Year awards. After lots of deliberation, spreadsheets, gushing and proselytising, we’ve put together our list of the very best games that came out in 2018, along with some personal faves. We also sent Pip out into the ocean to look at Atlas, the pirate MMO from the makers of Ark: Survival Evolved. It’s a huge nautical sandbox that can be shared by thousands of players, fighting in naval battles, conquering and ruling islands and, like Ark, getting chased by giant monsters. It’s been 20 years since Baldur’s Gate came out, cramming the Forgotten Realms into our PCs, so Paul Dean, Rick Lane, Richard Cobbett and Andy Kelly get a bit nostalgic, writing about their love for the epic isometric romp. Previews this month include Civilization 6: Gathering Storm, Resident Evil 2, Tropico 6 and more. As for reviews, we’ve got Hitman 2, RimeWorld, Fallout 76, Darksiders 3 just to name a few. This month's free gifts are a copy of Cook, Serve, Delicious and a 2019 calendar featuring the best gaming levels. 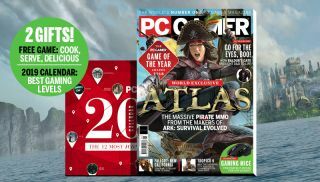 The PC Gamer Game of the Year Awards 2018. Pip tells us about Atlas. Everyone gets nostalgic about Baldur’s Gate. Civilization 6: Gathering Storm, Tropico 6 and Resident Evil 2 and more previewed. Hitman 2, Fallout 76, Darksiders 3 and more get the review treatment. Our gaming mouse group test.